The Marlowe celebrates a delightful decade of pantomimes produced by Eastry-based company Evolution Productions. Last year, Evolution Productions celebrated 10 years of pantomime in Canterbury’s Marlowe Theatre. The Eastry-based company, comprising of Paul Hendy and Emily Wood, have produced some star studded productions at Canterbury’s Marlowe in the last decade. • Continue reading/View the gallery at the Canterbury Times. Toyah Willcox – Sleeping Beauty, 2012/13 (Browse our Sleeping Beauty 2012/13 news here). The curtain closed on Canterbury’s Sleeping Beauty pantomime for the final time at the weekend. And crowds still turned up to the show, despite widespread snowfall across the area. Since its first show on 30 November, nearly 84,00 people turned up to see the pantomime, which starred singers Gareth Gates and Toyah Willcox. Another new review for Sleeping Beauty, now into its final 10 days at The Marlowe Theatre, Canterbury. High praise for the production, and Toyah, by the British Theatre Guide. As soon as ‘Bring Me Sunshine’ sweeps across the auditorium spreading its melodic happiness during the overture, the audience knows they’re in for a good time. Last year’s Cinderella at the Marlowe Theatre was a resounding success, but somehow Evolution Productions has managed to top it with this year’s festive treat Sleeping Beauty. Not only does the production boast an excellent Comic and Dame, it has one of the finest Villains in Pantoland in the form of Toyah Willcox’s Carabosse. An experienced pantomime performer, Willcox knows how to work an audience and ensure she gets the boos her character so desires. Her involvement in the schoolroom scene works well as she tries to think up ways to prick the Princess and a mysterious birthday card efficiently lures Beauty to her fate. • Continue reading at the British Theatre Guide. Read more Sleeping Beauty reviews here. Toyah’s brief appearance, from early December, on ITV1′s Lorraine is still available to watch online at the ITV website. More than half a million people have been checking out our Little Black Dress Diet – and there are just two days to go until our finale on Thursday! Today it’s all about last-minute tips, and to get us in the Christmas mood, Jane Wake has enlisted the help of panto stars Gareth Gates and Toyah Willcox to show us some great simple arm exercises. Sleeping Beauty Newsy Bits & Pieces! 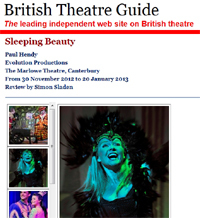 • Sleeping Beauty: Toyah’s 2012/13 panto, at The Marlowe Theatre in Canterbury, continues for another three weeks. The production runs until Sunday 20th January. 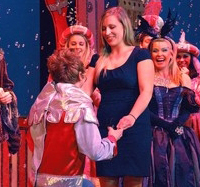 • This is Kent: Fairytale romance has happy ending: Love was in the air when panto star Lloyd Hollett proposed to his girlfriend live on stage. The comedian wasn’t joking when he sank to his knees before a sell-out audience of 1,200 to pop the question. She had been called on stage by Toyah Willcox, who is playing the evil queen, to be given a bouquet for helping with costume changes. • This is Kent: Panto Proposal: It was a magical evening at the Marlowe Theatre on Thursday, December 27 when comedian Lloyd Hollett proposed to his girlfriend Dannii Williams. Before the final song, punk singer Toyah Willcox called wardrobe assistant Dannii onto the stage to present her with a bouquet of flowers, before Lloyd got down on one knee. • Sleeping Beauty Proposal: View a short video clip of Lloyd proposing to Dannii at ‘You Tube’. 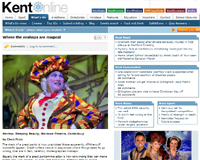 • Canterbury People: Win two tickets to Sleeping Beauty at the Marlowe Theatre: The competition ends on Friday 4 January 2013. Yet another positive review for Sleeping Beauty at The Marlowe, this one by This is Kent. Good Fairy Katrina Bryan from children’s TV show Nina and the Neurons has cast her magic spell the Marlowe Theatre to create a spectacular production of Sleeping Beauty. In the wake of last year’s hugely successful pantomime Cinderella, production company Evolution had a lot to live up to. The cast and crew do not disappoint. Sleeping Beauty has all the ingredients for a festive family treat packed with glitz, glamour, camp comedy and a fire-breathing dragon. Former punk princess Toyah Willcox is enchanting as the evil queen Carabosse. She has great stage presence and basks in the boos and hisses as she plots against the beautiful princess who *****s her finger on a poisoned needle and falls asleep for 100 years. The third review of the day for Sleeping Beauty, and it’s another one full of praise from Kent News. Writing a pantomime can be no easy task. There before you sits an audience as diverse as Alec Guinness’ CV and all with the expectation that their hard-earned money spent on the tickets will deliver laughs and pratfalls a-plenty. With that in mind, there’s also the added complication of weaving in the particular talents of your eclectic cast – drawn from a wide variety of showbusiness disciplines – and still make sure you don’t lose sight of driving the storyline along. Toyah Willcox is an excellent Carabosse, endlessly eliciting boos and jeers as her character looks to kill the young princess. • Continue reading at Kent News. A positive review for The Marlowe Theatre’s Sleeping Beauty, and Toyah, by The Stage. This rather wet show meant that my notebook was soaked during the water pistol chase. And water spouts out of every corner and orifice in a hilarious slapstick scene set in a bathroom with Lloyd Hollett – very accomplished as Jangles – and Ben Roddy, terrific as Nurse Nellie. But water makes for wonderful comedy, and Hollett and Roddy know how to exploit every drop of it. Rather drier, but also in fine form, is the ever-youthful Toyah Willcox, who cackles, curses, sings and dances like a teenager as Carabosse, the wicked fairy. Sleeping Beauty reviewed by The Public Reviews. It’s panto time again and Paul Hendy and Emily Wood’s Evolution Productions is back in residence at Canterbury’s Marlowe Theatre. This production brings the sunshine back to a cold winter’s evening with plenty of laughs and heaps of audience participation. The ‘big names’ this year are Toyah Willcox as Carabosse the bad fairy, and Gareth Gates as Prince Michael, closely followed by children’s favourite Katrina Bryan as Fairy Moonbeam. Toyah Willcox has an incredible energy and presence, and her vocals are strong in her rock numbers, as expected. • Continue reading at The Public Reviews. A few screen caps from Toyah’s guest appearance on Lorraine. Click below to zoom! This morning’s edition of ITV1′s Lorraine is now available to watch online at ITV Player. Toyah’s short guest appearance is in part three of the programme. This will remain online at ITV Player for the next seven days. Toyah’s guest appearance on Lorraine, along with Gareth Gates, finally airs this morning. The footage was pre-recorded last week. Lorraine is airing this morning from 8.30am to 9.25am on ITV1. It should be available to watch online at ITV Player post broadcast.